Divisions: The country of France is divided into 27 administrative regions. 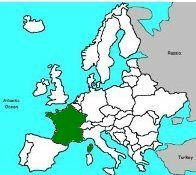 There are 22 regions in the main area of European France called "metropolitan regions" and 5 regions overseas. See the map to the right for the 22 metropolitan regions. The overseas regions include French Guiana, Guadeloupe, Martinique, Mayotte, and Reunion. The largest regions by population are Ile-de-France (the largest and includes Paris), Rhone-Alpes, and Province-Alpes-Cote d'Asur (PACA). Description of flag: The flag of France, also called the "Tricolour", was readopted in July of 1830. It consists of three equal vertical stripes of blue (left or hoist side), white (middle), and red (right). Sometimes the three colors are said to represent the three parts of the French motto: liberty (blue), equality (white), and fraternity (red). Origin of the name France: The name "France" comes from the Latin word "Francia" which means "land of the Franks." The Franks were an empire in France during the Middle Ages.